These Easter candy puzzles are great to add to your Easter Baskets. Each contain has sweet tart candy inside. Connect the candy and make a puzzle pet. 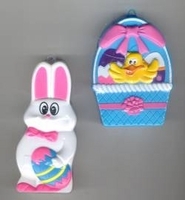 These Easter candy puzzles come in three adorable Easter designs; chick, Easter basket or bunny. Due to availability design will vary.